This follows up on the discussion of the Eucharist : how is it a "remembrance of me", is it a meal or a sacrifice? The latter contention is a futile one since it is not a matter of either – or. To Semites a meal is a sacrifice and a sacrifice is a meal (cf.the Muslim hallel). Both are symbols and both can apply equally to the symbolised. Religion is living poetry and its language is properly symbolic and metaphorical. What is flowing freely ought not be frozen into blocks of ice. This is true both of biblical account and of magisterial statements of the Church. (It is of interest to note that Denzinger's compendium of Church announcements is called Enchiridion Symbolorum, "Handbook of Symbols"). At the Last Supper, in the course of the meal, Jesus enacted a ritual rehearsal of his Passion & Death. It enabled him to underline beforehand the meaning of his unspeakable suffering. By it he also left us a symbolic ritual by which we could recall the events of Good Friday, and thereby play a posthumous part in it. Even beyond being a meal and a sacrifice, the Eucharist embodies the Paschal Mystery of Jesus, his Incarnation, Death and Resurrection. This mystical passage through death to life had been foreshadowed in the Jewish Passover, which commemorated the crossing of the Red Sea, the delivery of the Chosen People from the slavery of Egypt and the covenantal encounter with God on Mt Sinai. The Paschal Mystery is part and parcel of our daily lives united to Christ as we constantly "pass through death to life" in the ups and downs of our lives. Jesus' Passover is a template of much of our lives, and of life itself, giving meaning to the repetition of death-to-life situations in our experience. So our part in the Eucharist offers profound meaning, not only of what happened to Jesus, but of our own daily experience ever since our baptismal initiation into the mystery of Christ. As Jesus said "Do this is remembrance of me". You follow the discussion this commentary generated on the catholica forum HERE. In 1874 there was nothing at Katoomba apart from a railway siding called "The Crushers", so named after the nearby quarry and crushing equipment which supplied ballast for the permanent way. 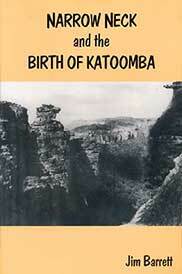 Between 1879 and the 1880s John Britty North started mining for coal and shale below Orphan Rock and Narrow Neck. These early mining operations were mainly responsible for the establishment of Katoomba, and for the opening up of Katoomba's now famous scenic attractions.